A leafy spurge infestation fills an entire section of river bank along the Yampa River east of Craig. The aggressive and invasive weed can send roots as deep as 60 feet and can spread seeds in a burst as far as 30 feet, as well as down river. The weed can put entire agricultural fields out of production if not effectively managed, but is even more difficult to manage in riparian areas along river banks. A coalition of ranchers and environmentalists, politicians and bureaucrats, and Jimmy-Buffett-loving river recreationalists came together Friday to learn about a quiet scourge overtaking the banks of the Yampa River known as the leafy spurge. The plant itself looks innocent enough, with little yellow flowers that turn entire sections of river bank into a sea of green and yellow. But the demure-looking weed is extremely aggressive and invasive, and has wreaked havoc in states like Montana and North Dakota, where more than 2 million acres of ranch land have been put out of production due to the noxious weed. 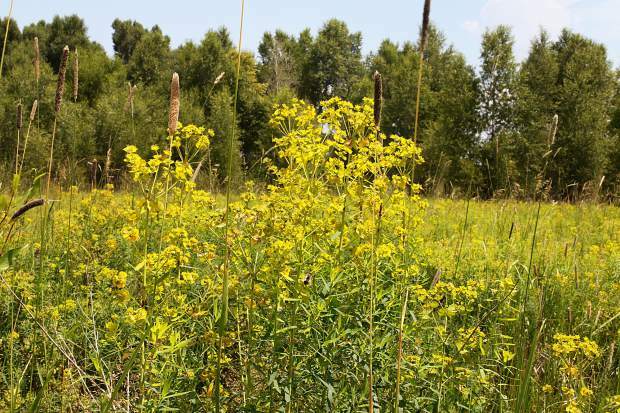 Formed in 2015, the Yampa River Leafy Spurge Project brought together partners in Routt and Moffat counties to tackle the growing infestation, which first took root more than 40 years ago. The problem has eluded an effective solution for decades, as the conditions unique to river banks challenge all variety of treatments from chemical to biological to mechanical. The result is that debate continues about how to deal with the destructive plant, and for now, officials have focused on keeping the infestation from spreading. Moffat County has taken a similar approach. Without better funding or better solutions, local officials have little recourse to completely eradicate the problem. The project received $30,000 in funding from the Colorado Department of Agriculture in 2016; Moffat and Routt counties each received $10,000 to fund projects to target infestations, and $10,000 went to landowner education and outreach. Additional county and federal funds also flow towards containment efforts on private, county and federal lands, but for a weed that sends roots as deep as 60 feet down and is able to broadcast its seeds up to 30 feet, as well as send them downriver, available resources have been outmatched. “For our economy’s sake, from a recreational standpoint, an agricultural standpoint and an environmental standpoint, it’s a big issue,” said Todd Hagenbuch with Natural Resources Conservation Services.